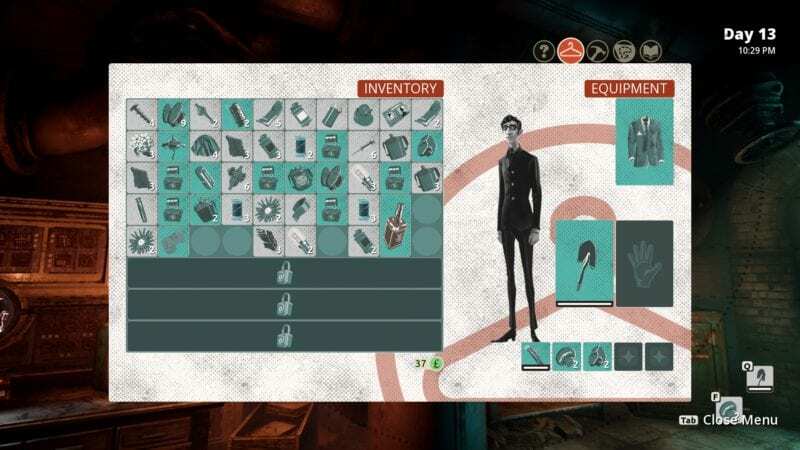 We Happy Few is very much a survival game, and you’ll need to collect resources to manage your fatigue, hunger, and thirst meters. As you explore the world and continue picking up items, your inventory will eventually get clogged up. Thankfully, the game’s inventory system is pretty organized on its own, so you won’t need to do too much to make some extra space. First up, you can check your inventory by pressing the Tab key and clicking on the briefcase icon. You’ll then see a whole row of icons that indicate different categories. You’ll have different categories for healing items, gadgets, weapons, food and drinks, and crafting components. You can also click on the Sort option on the side to sort out your inventory to see which your most recent items are. If you want to discard items, all you have to do is click on the item and hit the G key. You can also hold down G to discard stacks of that particular item if you have multiple of them. Doing this will cause you to drop those items on the ground around you, so you can always pick them up again if you discarded something by accident.